This review first appeared in the January 17, 1997 issue of the North County Times. Leonard Hochman is virtually unknown outside Boston. But like Wes Montgomery, who spent most of his career playing clubs in Indianapolis before being discovered nationally, Hochman's anonymity is not due to lack of talent. 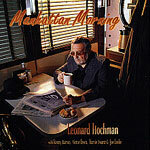 Hochman is a virtuosic jazz reedman, playing tenor in the sweet school of Lester Young. And he also plays bass clarinet with equal verve and suppleness, giving his straight-ahead jazz a lower-register ethereal shimmer that's always grounded in the solid grooves he and his band lay down. The quintet the producers surrounded him with on this date gives Hochman a chance to really show his stuff: Kenny Barron on piano and Victor Lewis on drums anchor the band. Cats like that won't play with a hack, either: Hochman is the goods. The tunes are about split between originals by Hochman and covers of standards by the likes of Dexter Gordon, Tommy Flanagan and Art Pepper. All are performed with imagination and panache.